Will Marilyn's curves save Mississauga? If you live downtown, it is easy to dismiss the suburbs. But while efforts to increase density and reduce the sprawl of the Greater Toronto Area are generally focused on the downtown core, the suburbs are where much of the real change must come from. With much of the infrastructure and building already in place, it may seem an impossible task. But Mississauga - a key portion of the city's suburban sprawl - is making an attempt. Mississauga has a lot of work to do. With one million people, it is the sixth largest city in the country. However, it has half the density of Toronto, and it has no higher order transit than its many buses. The city's roads are either extremely busy, or dead of traffic. Pedestrians and bicyclists are limited to the quieter residential neighbourhoods. The architecture, up until now (and with the exception of Mississauga's Civic Centre), has been uninspired. But Mayor Hazel McCallion has hope that this can be changed. 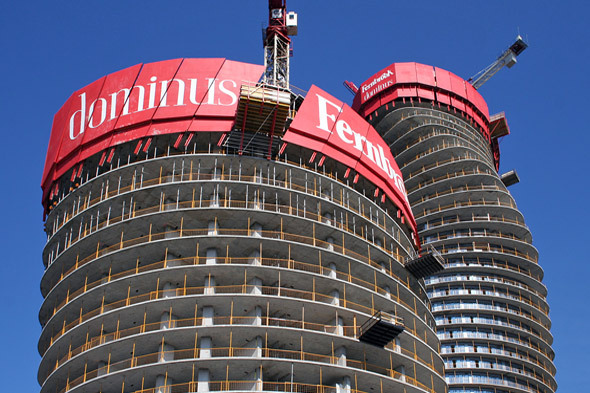 The centrepiece and symbol of this change is the Absolute World condo complex rising at the corner of Burnhamthorpe and Hurontario. 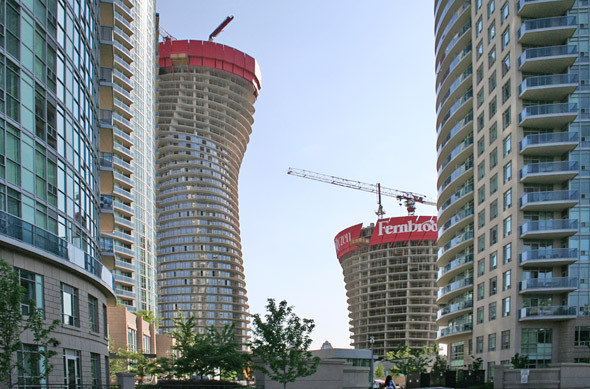 The design of two of the towers in the five tower complex was chosen from the results of an international competition initiated by Fernbrook and Cityzen, the complex's developers. The international competition, the first of its kind in the GTA since the one for Toronto's New City Hall, attracted 92 responses from 70 countries. The winning design has been a popular success, with the results of a vote among Mississauga residents showing overwhelming support for the "Marilyn Monroe" design - so-called for its slinky curves. 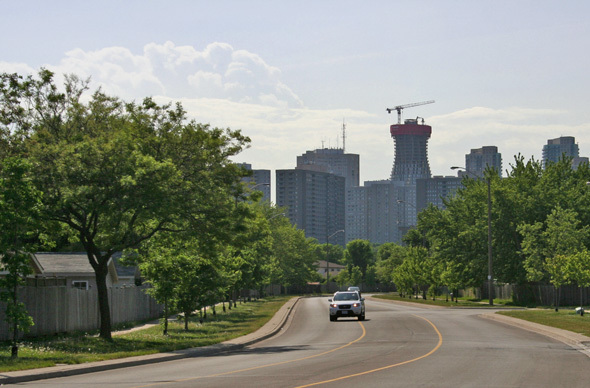 Rising to over 500 feet, these towers will dominate Mississauga's skyline when completed. The towers have been so popular they have even prompted jealousy from some Toronto residents who feel that they don't belong in Mississauga. But the Marilyn towers have big work to do in Mississauga. Although not officially part of Mississauga's in-progress 21 Downtown Master Plan, they are an indication of where the city is trying to head. As Janice Baker, Mississauga city manager, told Christopher Hume, "It's clear the future will be dense, vertical and transit-based. In the past the market for that wasn't there, but now that market is there. " The 21 Downtown Master Plan imagines turning the parking lots around the Square One shopping centre into mixed retail and commercial areas, adding a higher-order transit line on Hurontario, and producing more pedestrian and cyclist-friendly streets. It is hoped that the higher density around the core will help support the pedestrian uses, and in turn, make the area more popular for offices and workplaces. Much of this work is still in the planning stages. Although many municipalities are trying to retrofit their suburbs, it will be at least a decade before we can make solid judgements about their success or failure. 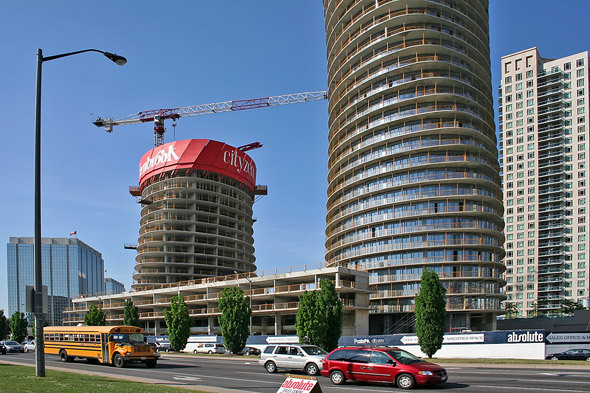 Until then, we can only wonder: will the Marilyn towers be a symbol of Mississauga's bright future, or an unsuccessful attempt to cover up the city's past planning mistakes?